Men of Stamina—Sir Ernest Shackleton. 043. 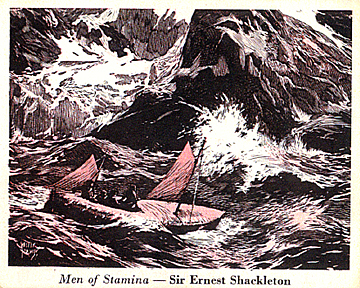 MEN OF STAMINA -- SIR ERNEST SHACKLETON. Issued by Stamina Self-supporting Trousers. (1946-1966). Card number 28 in Series 10 [16-30]. Size: Ca. 2.5" x 3". Recto: View of the James Caird with coast in background.